LOCAL woman, Nicki Morton-Holmes, has chosen a rather unconventional way to celebrate her 70th birthday – a skydive and a wing walk! 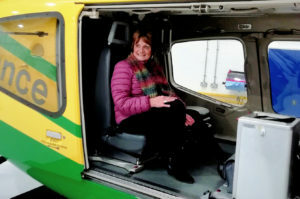 Nicki, who turned 70 in February, is raising money for the Wiltshire Air Ambulance and has set herself a target of £1,000 after already smashing her initial £500 target. She will first take part in a skydive next week, on Sunday 21st April, and then four weeks later, on Saturday 18th May, she will take to the skies again, this time standing strapped to the top of a plane for a wing walk. The offer to take part in the wing walk came direct from Wiltshire Air Ambulance after Nicki told them about her ambitions when she contacted them for a t-shirt to wear for her skydive.